Halloween is the one time of the year when you can be anything you want to be. Of course you could go with the same kitten ears you wore last year or don the old sailor’s cap, but is that really the character you dream of becoming? Are you going to let people remember you as the 17th bunny at the party, or are you going to set yourself apart and make a real fashion statement? Plus, who hasn’t aspired to be a Chipotle burrito once or twice? Now is your chance. Carpe D-Yum, right? Cronut (n): A cross between a croissant and a donut. This delightful dessert has only been around since 2013, so you’ll never see another party-goer wearing your costume. In fact, no one on the Internet has even made this one yet, so get on it! 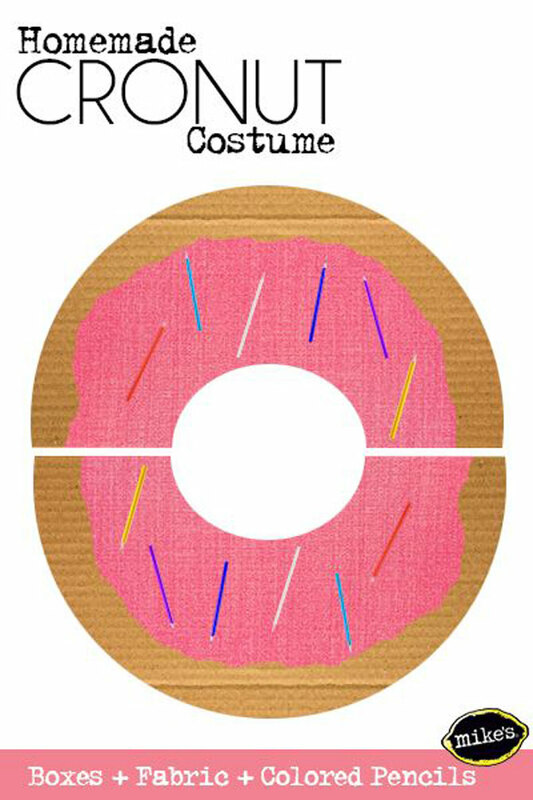 And the best part: cardboard, fabric and colored pencils are all you need to create it. Take that 10 dudes wearing the same 1920’s gangster outfit. All college students know that sriracha is the king of condiments when you’re tight on cash. And now it’s also the king of costumes for those on a budget. Spice up the night with a red shirt, some puffy paint and green construction paper. Who needs a flask when you can literally wear your wine? Cardboard and paper are the main materials for this one, making for a cheap way to meet a few new friends at this year’s Halloween party. Every Hallowen, Chipotle offers $3 burritos to customers in costume, so imagine the laughs you’ll get wearing this outfit to score yours. With construction paper, aluminum foil, and some green tissue paper, you and your Chipolt-bae can turn heads all night. If Asian cuisine is your thing, then this costume is right up your alley. And the options are endless. It’s oh-so-comfy and with a bit of fabric and a needle and thread, it’s easy to make, too. BONUS: Grab a few friends to do the same and become a walking Bento box. I’m sure you can’t eat a box of Nerds today without thinking about that one kid in your 3rd grade class who always laughed uncontrollably when he told you “You are what you eat.” But you’ll get the last laugh in this outfit. Grab some cardboard, paint, and dorky glasses and you and bae can finally live up to the joke. Halloween is all about the candy, so balance out your sugar binge with a healthier option. Think of it as an adorable way to get in one of your five-a-day. All you’ll need is some yellow clothes and green paper to make this quick and easy costume.